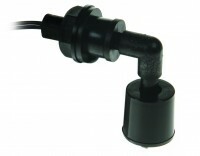 This polypropylene level switch is horizontally mounted to give either a high level or low level signal and is reversible meaning that it can be either normally open or normally closed. When the magnetic field of permanent magnet inside the float is moved into to the proximity of the reed switch inside the stationary stem, the reed switch “snaps” the contact together and closes the electrical circuit. When the magnetic field is moved away from the reed switch, the reed switch contacts move apart and the circuit is open.